Sugar cravings. We all get them from time to time. Whether you've already gone "sugar-free" or are just beginning to cut out refined sugars, we have some tips to help when those little monsters creep up. It's very common to confuse hunger with thirst. The saying goes, "When you feel thirsty, you're already dehydrated." This is not to say that you are dangerously dehydrated or that it's too late, but it is your body's way of saying, "Hi, it's been a bit too long without fluids." 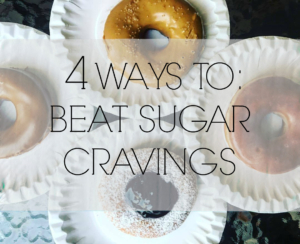 If you're still feeling the craving after drinking a glass of water..
One of the best ways to beat a sugar craving is to get out of the kitchen or area where the temptations are. Going for a walk outside and changing the scenery can do wonders! Exercising or visiting your nearest health and wellness center will also help re-balance and center you (not to mention give you an extra hour or so of space from the craving). If going outside isn't an option, moving to another room and jumping up and down, doing some light stretching, dancing, or even walking up and down the stairs also gets us back into our bodies and out of the mental obsession that often comes with cravings. If you're in the office and none of these are options, at least go to the restroom and do some jumping jacks or superhero moves to pump yourself up. You can beat this! There are actually different types of hunger we experience. Checking in with yourself before caving into the craving can be helpful in discerning what kind of hungry you really are. Are you stressed? Bored? Lonely? Worried? Managing these emotions before deciding what to eat will often lead to healthier choices. Plus, you get the added benefit of acknowledging and moving through stuff that's trying to hide! You can do this many different ways including meditating, calling a friend/trusted mentor, or journaling. Sometimes, we truly are hungry and need a little energy boost. After drinking water, moving, and checking in with myself (See #2 and #3), if I am still thinking about eating something sweet, I will go for the healthier option around. This might take some planning. Have fruit and nutritious options at hand if you know yourself to be prone to sugar cravings. In my experience, having fruit on its own sometimes leads to wanting more so I will mix it with some type of protein to keep the glycemic impact on my system lower. What are some ways you outsmart your sweet tooth? Bonus: Speaking of teeth.. brushing them is also a fantastic way to shift gears away from sweets. The minty-ness not only makes those sugary treats seem less desirable taste-wise, it also seems to send an "I'm done" signal to our brain.